Ocean Plastic, What is it & Just how big is the problem? Product Design & Development » Part 1. Of our Series on Ocean Plastic, What is it & Just how big is the problem? Do policymakers understand the problem and how much responsibility lies with Product Designers? What is Ocean Plastic and why has it become such a big problem? This is a question we’ve been discussing a lot recently at Flynn Product Design. How much responsibility lies with Product Designers and do policymakers really understand the problem? We’re going to attempt to explore some of the key issues Ocean Plastic raises in a three-part article. In our first part, we spoke to our Director Chris Flynn about his views on Product Design and its relationship with plastic. “When I was 3 years old I recall playing with my Fisher Price Garage, one of my favourite toys. Somehow, even at that age, I recall the stress colouration marks on the plastic ramp which would have been made with Polystyrene at the time. Fascinated by its qualities I asked my mum ‘Where does plastic come from’ – ‘Plastic comes from petrol’ was her answer. By age 17 I was an undergrad in Product Design Engineering, attending daily lectures designed to focus our minds on sustainable design, Bio-Polymers and how to understand our place cultivating product life cycles. Fast forward two decades; as a consultancy, I wanted to invite discourse on the subject of Ocean Plastic. What is it? How did we arrive at today’s problem and what is our role as product designers? I feel that right now the industry needs to tackle it head-on, but not the same way as before”. “Design development Industry holds a responsibility to be ahead of the curve in understanding why the situation only deteriorated in the past 20 years. Being honest with innovation predictions and learning to look at the problem from new perspectives as the boundary of a consumer society blurs. This is now a problem of our civilization”. By now you’re probably well aware just how large an environmental issue plastic pollution in our oceans is. The severity of the issue has even prompted number 10 to urge Commonwealth leaders to join ‘together’ to tackle the ‘scourge’ of discarded plastic. As the world’s population continues to grow, so does the amount of waste people produce and the problem of how to dispose of it. According to the Ocean Cleanup Foundation, the accumulation in the Pacific Ocean known as the Great Pacific Garbage Patch is now twice the size of France, containing 1.8 trillion pieces of plastic and weighing around 80,000 tonnes. This is not just a catastrophe for some far-flung place, every freshwater source on the planet shows some microparticle pollution from plastics, including the UK. Our cleanest rivers are impacted at the microscopic level, which can cause ‘endocrine disruption’ to travel up the food chain. The workhorse of the modern economy, lightweight and durable, plastic has been used to make a vast range of products since it’s introduction over 100 years ago. It could be argued that we’re living in the ‘Plastic Age’. In the last 50 years at least we’ve fallen in love with plastic. We’ve become a disposable culture that’s become too comfortable and reliant on “Single Use Plastics”. Since we started engineering polymers to make plastic on a mass scale in the 1950s as a by-product of the petrochemical industry (which uses about 6% of all the oil we extract a year) plastic has spread to myriad manufacturing processes. It makes up our clothes, containers, bottles, electronics, food trays, cups and paints. Our cars depend on it, so do our computers, roofs and drain pipes. It’s the global packaging material of choice. We sleep on it, wear it, watch it, and are in direct contact with it in one form or other all day and night. You may be wondering why we should focus on the environmental impact of plastic? As product designers and design engineers, we’re experts in the art of using materials. Plastic, as you can probably guess, is by far the single most common material to find incorporated in a consumer product, coupled with metals as a distant second. Plastic and product design go together like two peas in a pod and Salt and Pepper. The bread and butter of modern product development, surely designers have a duty to help inform where plastic ends up? Chris goes on to say that “Issues surrounding sustainable material selection have always been paramount way back in 95’ and certainly more so today. As product designers we are able to sculpt with plastics, it’s so versatile with engineering properties we can tailor for each component in an assembly. Cost, weight, toughness, scratch resistance properties difficult to match for mass production. Plastic is evolving, but we think it’s here to stay. You could draw an analogy with the transport problem, be that pollution or log-jammed cities. Some think the solution is for everyone to cycle. Whilst, I would sound ultra-green if I agreed, I think that perspective grabs headlines, but it’s just a quick fix. Instead, why not understand just why the car is so successful. Let’s be pragmatic, remove the BS and use that knowledge to break down the problem. With cars, it’s airborne pollution and the infrastructures we have built to carry cars that choke in current volumes. If we had evolved infrastructure and cars that run on water, which has been possible for 30 years, cars of the future could move through a network like blood cells move through your body, self-organizing and reducing pollution and gridlock roads. In the same way, let’s be realistic about plastic futures. Mass produced moulded products are likely to remain part of our future, even as the materials evolve. We’re working with many clients on reducing their plastics investments (with two such projects year) which focus on illuminating single-use plastics. It’s awesome to be part of changing attitudes towards a material we know and love. We fully agree single-use plastic has to be halted in its tracks plastic should not find its way to the ocean full stop”. The ecological issue surrounding ocean plastic is simple, Plastic should not be in the ocean – But the picture for us as a society is complex. Only 9% of all plastic ever produced has been recycled. The rest has either gone into landfill, been incinerated or has escaped into our environment. 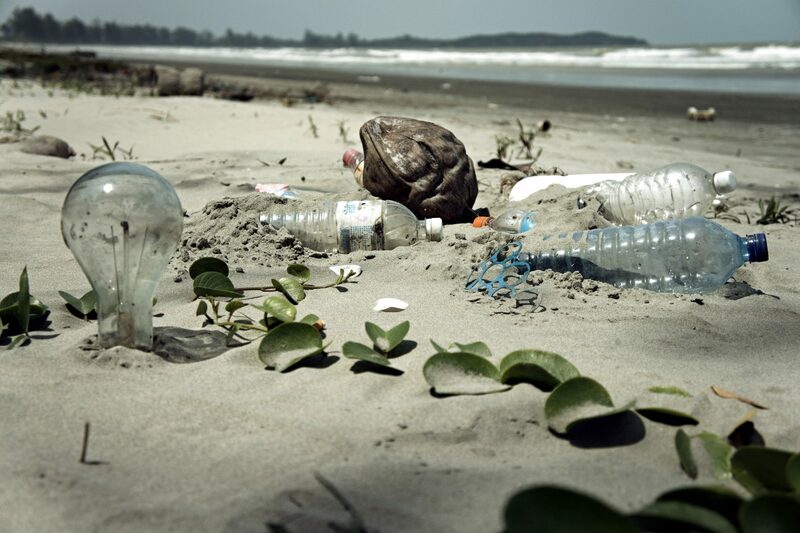 The Ellen MacArthur Foundation reports that ‘at least 8m tonnes of plastics leak into the ocean every year. According to the MacArthur Foundation’s report launched at the World Economic Forum this month, new plastics will consume 20% of all oil production within 35 years, up from an estimated 5% today. Unless something is done about the way we currently interact with our oceans there could be more plastic than fish in our oceans by 2050. According to research by the Ocean Cleanup Foundation plastic releases dangerous toxins. Some plastics can actually decompose rapidly and will “photo-degrade” in the ocean leaching potentially toxic chemicals such as bisphenol A into the seas. Plastic’s been found to have caused the death of countless seabirds, turtles, and ocean mammals. Animals can become entangled in waste plastic, choke or suffer internal blockages leading to them starving to death. Whales predate Jellyfish, which they mistake plastic bags for and consume in alarming quantities. As plastic also enters our food chain we don’t yet know what this means for humans with some of the compounds found in plastic posing the risk of being Endocrine Disrupting or having other potential human health effects. 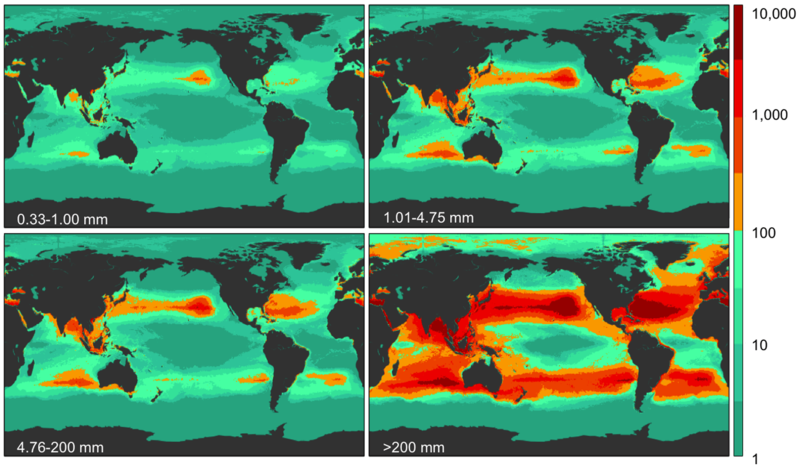 Inset above, one study predicted ocean plastic pollution by particle size. How does plastic end up in our oceans anyway? Monitoring plastics post production is very problematic and the scale of the problem is part of the riddle and it is something of a mystery. Plastic waste does have initiatives in place for its recycling and disposal, so how do large plastic items end up in the oceans? 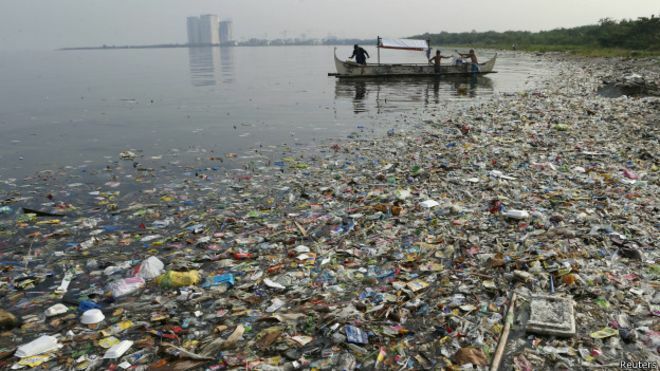 Allegedly some of the biggest offenders are unscrupulous waste practices by other countries around the world, literally dumping landfill into the oceans. The landfills in oceanic islands such as the Maldives for example, where landfill islands literally overflow into the pristine waters. Some plastics sent for recycling instead end up being dumped at sea. Storms wash plastics from wasteground into tributaries and rivers and eventually the sea. It’s difficult to ascertain just how much plastic pollution in the UK enters the sea. It’s clear that those plastics we flush, such as microbeads in toothpaste or facial scrubs even the clothes we wash do contribute to the burden on the watercourses. Some studies suggest synthetic fabrics lead to 700,000 fibres making it into the drainage for each household wash.
Chris comments, “It’s finally happening, a cultural rejection of single-use plastics. There’s much greater understanding of the product lifecycle mismatch of single-use or even a few seconds use such as a PS spoon in your morning cuppa. Interestingly, recently I was standing behind a lady buying a coffee from a Farmers Market type coffee house, who was annoyed at the “plastic spoons” they had on hand. ‘I don’t want to use plastic’ she said. When she’d left I took a closer look. The spoons were actually Biopolymer – Food starch Polymers, which had been injection moulded and are actually fully biodegradable. It’s clear the Biopolymer companies have mimicked plastic so well, it’s become practically indistinguishable. The lady was right. They were plastic, Bioplastic. I think as product designers we need to work with those human factors. In that context, the product did not meet the expectation of a consumer as it likely still felt wrong to waste this pristine spoon on a single use. Moreover, it didn’t sing its nature as degradable as well as the punched wooden spoons we often fumble to eat noodles with at music festivals’’. It’s fantastic that our industry has engineered solutions to offer us biodegradable polymers. But as in the example discussed above the reality and actually getting consumers to adopt these materials is sometimes more complex. What I hope we painted clearly above is the scale of the problem of Ocean Plastic. It’s not all doom and gloom, Check in with us next month for Part 2. We’ll be talking about innovative businesses that have set out to make an impact on Ocean Plastic.